Mark DeNyse can work a thermostat as well as the next guy, and he’s perfectly capable of watering his own lawn. But he’d rather let the house take care of such things. 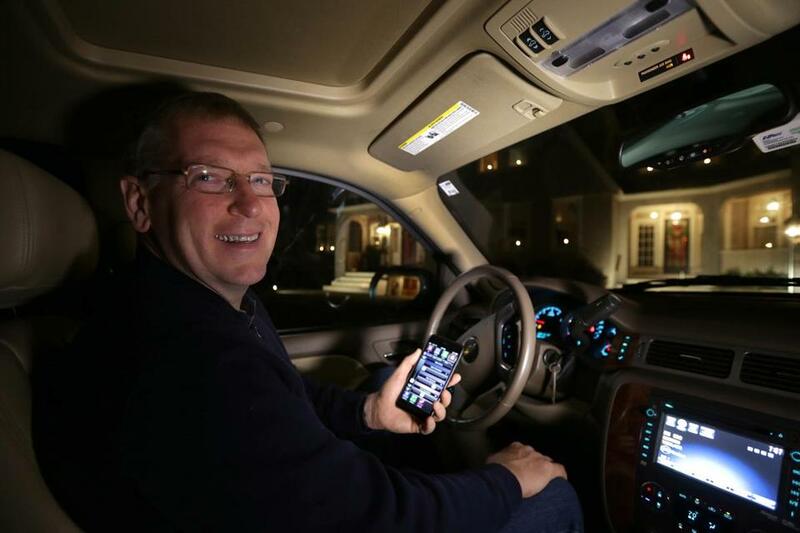 Mark and Dolly DeNyse of Hingham can use their smartphones to control their Nest Learning Thermostat, but it knows when they are home and delivers hot or cold air only when needed. So the 50-year-old Internet developer has given his Hingham home a brain transplant. DeNyse has plugged in a Nest Learning Thermostat that knows when his family is at home and delivers hot or cold air only when it’s needed. He’s hooked up a RainMachine, a device that knows not to turn on the sprinklers in January or the day after a thunderstorm. He’s even placed sensors under the dishwasher, laundry machine, and water heater that’ll ping his smartphone if they spring a leak. But smart-home technology isn’t just for mansions. 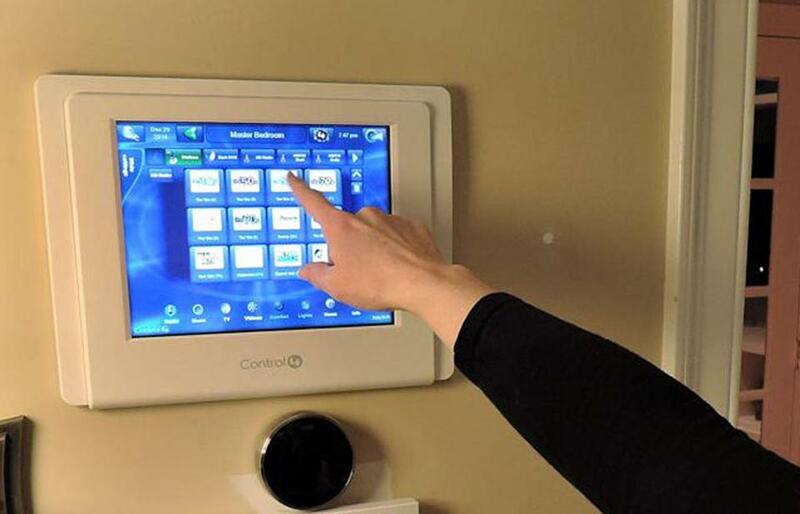 Devices that once might have cost thousands of dollars today sell for hundreds, making it possible for many homeowners to boost a building’s brainpower. What we discovered the hard way is that when something breaks, it’s not like someone from the IT department can make a house call. Science fiction writers like Ray Bradbury speculated about the wonders and dangers of smart houses back in the 1950s. By the late ’70s, companies had begun developing primitive systems that could transmit simple commands through a home’s electrical wires. Today’s home-automation systems use a combination of wired and wireless technology to enable fingertip control of every electrical or electronic device in the house. Today, he strolls through his home, iPad in hand, master of the house. Using software developed by Savant , Dwyer can remotely control home heating or cooling, tune in a basketball game on the living room TV, and play Sinatra tunes in the kitchen while Led Zeppelin is blasting in the basement. But Dwyer is a cautious pioneer. While he enjoys controlling his home with the tap of a tablet, he’s not interested in home automation devices that make their own decisions. Rick Dwyer controlled his home’s lighting using an app on his smartphone. Google Inc. purchased Nest last year for $3.2 billion. With sales of more than a million smart thermostats, it’s become the iPhone of smart-home technology — the first such gadget to become a mass market hit. Nest relies on sensors and software to understand users’ needs. Because its motion tracker knows when people are at home, or away, the Nest can gradually learn a homeowner’s occupancy patterns. It can also track how long it takes for the house to warm up or cool down. So the Nest knows it should turn the heat down late in the morning, to reduce the heating bill, but start warming the place up 45 minutes before the owner arrives. DeNyse has also “smartened up” his home’s lawn sprinkler system. It was formerly controlled by an old-school device that sprayed water at preset times. But with his RainMachine, the lawn gets watered only when it isn’t raining. The small box gets regular weather updates from the National Weather Service, so it knows to let the water flow on dry days but to shut it off when there’s an 80 percent chance of rain. 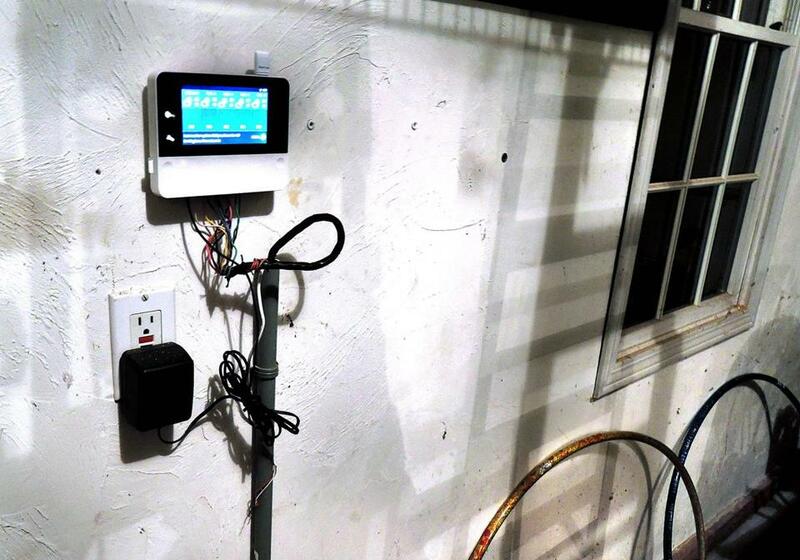 DeNyse also uses an iPad and software from Control4 Corp. of Salt Lake City as a master control for his home’s electronic systems. Thanks to Control4, the DeNyses can use their smartphones or this touchpad to turn on the lights. And while the DeNyses’ washing machine, dishwasher, and water heater aren’t especially brainy, they’re getting some very clever backup. A company called SmartThings makes an array of Internet-linked sensors that automatically notify a homeowner about all manner of unwelcome events. DeNyse uses a SmartThings motion detector in the hallway to warn of unexpected visitors. He’s got SmartThings sensors in the doors that will send an alert if one is ajar. And under the home appliances, there are SmartThings moisture sensors that will instantly warn Mark or his wife, Dolly, if those machines spring a leak. It’s no surprise to find such advanced technology in a high-end home. What’s surprising is how cheap it all is. A Nest thermostat costs $249; a RainMachine will run you about the same; a SmartThings kit starts at $199. At these prices, many homeowners can make a few upgrades. For example, software engineer Mark Colan and his partner, Joan McCandlish, are happy with their old-school programmable thermostat, and have no intention of installing the famous Nest device. “Not everything needs to be high-tech,” Colan said. 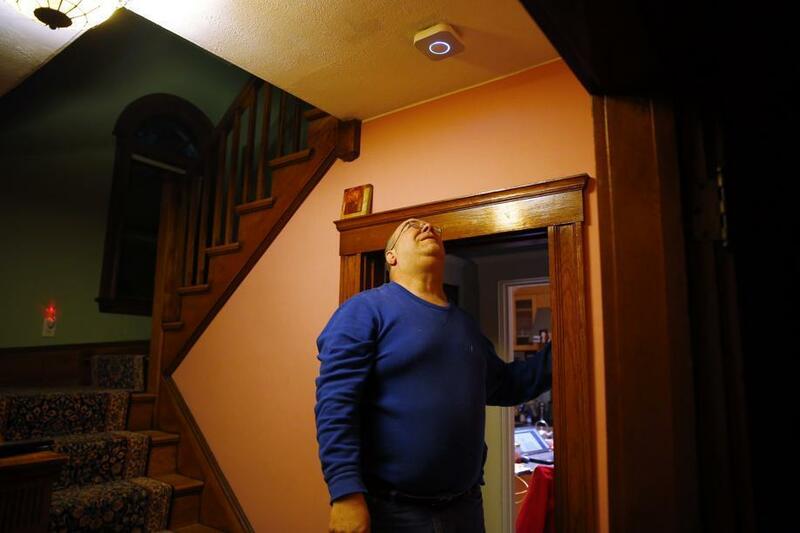 But he has equipped his Medford home with a different Nest product, the company’s $99 Nest Protect smart smoke alarms. Mark Colan, a light sleeper, said he prefers the human voice of the Nest Protect system. The device emits a louder alarm as a follow-up. Colan was attracted more to the Nest Protect’s elegance than its brains. “I’m a light sleeper,” he said. “I don’t like waking up with my heart pounding.” Instead of the usual ear-splitting squeal, the Nest Protect begins by announcing the danger in a clear human voice, adding a louder alarm as a follow-up. The Nest Protect can tell the difference between heavy, dangerous fumes and the lighter kind that comes from cooking smoke or a smoldering candle. When the risk is less severe, the Nest Protect broadcasts a gentle “heads up” warning. Because each alarm speaks to the others over a Wi-Fi network, they know which part of the house is at risk. So the alarm in the upstairs bedroom can warn that there’s smoke in the basement. The Nest Protect even acts as a smart night light, glowing gently when someone walks past it. 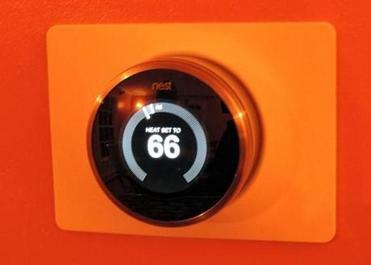 Smart home systems like the Nest Protect are catching on with consumers, but are still beset by some vexing problems. For instance, many of today’s home-automation products can’t talk to one another. If a remote door lock uses a different wireless standard than a remote lighting system, hapless consumers may just walk away. By contrast, everybody loves Wi-Fi because it works the same on every digital device. The home automation industry should take the hint. They must also secure their products against Internet criminals. But consumers are snapping up smart devices like thermostats and smoke detectors that boost their home’s intelligence a few neurons at a time, with low cost and little risk. Perhaps in 10 years houses with brains will become as commonplace as houses with broadband.